In my previous post, I talked about vSAN Encryption configuration, and key re-generation among other topics. On that post you can see that there is a trust relationship amongst the vCenter and KMS server/cluster. But what happens if my vCenter dies, gets corrupted, or I simply want to build a new vCenter and migrate my vSAN nodes to it with Encryption enabled??? One day, the lab that hosts my vCenter had a power issue and the VCSA appliance became corrupted. I was able to fix the issue, but then discovered that SSO was not working. I figured it was faster to deploy a new VCSA appliance rather than troubleshooting (yes, I’m impatient). I deleted the old vCenter and proceeded to deploy a new VCSA. As I was adding the host to the new vCenter, I remembered that vSAN encryption was enabled. Now what? Sure enough after all the hosts were moved, the drives from within the Disk Groups were showing unmounted. I went ahead and created a new relationship with the same KMS cluster, but the issue persisted. If you run the command “vdq -q” from one of the host, you will see that your drives are not mounted and are ineligible for use by vSAN. In the UI you will see that your disks are encrypted and locked because the encryption key is not available. In order to recover from this and similar scenarios, it is necessary to create a new cluster with the same exact configuration as before. Although I did establish a relationship with the same KMS cluster, I missed a very important step, the KMS cluster ID. It is imperative that the same KMS cluster ID remains in order for the recovery feature to work. Let’s think about the behavior. Although the old vCenter is gone, the hosts still have the information and keys from the KMS cluster, if we connect to the same KMS cluster with the same cluster ID, the hosts will be able to retrieve the key (assuming the key still exists and was not deleted). The KMS credentials will be re-applied to all hosts so that hosts can connect to KMS to get the keys. Remember that the old vCenter was removed, so I couldn’t retrieve the KMS cluster ID from the vCenter KMS config screen, and this environment was undocumented since it is one of my labs (it is now documented). Now what? Glad you asked. Let’s take a look at the encryption operation. In this diagram we can see how the keys are distributed to vCenter, hosts, etc. The KMS server settings are passed to hosts from vCenter by the KEK_id. In order to obtain the kmip cluster ID, we need to look for it under the esx.conf file for the hosts. You can use cat, vi, or grep (easier) to look at the conf file. You want to look for kmipClusterId, name(alias), etc. Make sure the KMS cluster on the new vCenter configured exactly as it was before. After the KMS cluster has been added to new vCenter as it was configured in the old vCenter, there is no need for reboots. During reconfiguration the new credentials will be sent to all hosts and such hosts should reload keys for all disks in a few minutes. 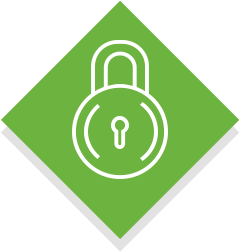 New on vSAN 6.6, vSAN native encryption for data at rest is now available. This feature does not require self-encrypting drives (SEDs). 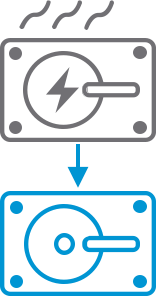 Encryption is supported on both all-flash and hybrid configurations of vSAN, and it is done at the datastore level. It is important to note that data is encrypted during the de-staging process, which means that all other vSAN features are fully supported, such as deduplication and compression, among others. Given the multitude of KMS vendors, the setup and configuration of KMS is not part of this document, and it is a pre-requisite prior to enabling encryption on vSAN datastore. or if you enable Encryption or Deduplication and Compression on an existing vSAN cluster, the ODF gets upgraded to the latest version automatically. Initial configuration is done in the VMware vCenter Server user interface of the vSphere Web Client. The KMS cluster is added to vCenter Server and a trust relationship is established. The process for doing this is vendor-specific. Consult your KMS vendor documentation prior to adding the KMS cluster to vCenter. To add the KMS cluster to vCenter in the vSphere Web Client, click on the vCenter server, click on “Configure” tab, “Key Management Servers”, and click “add KMS”. Enter the information for your specific KMS cluster/server. Once the KMS cluster/server has been added, you will need to establish trust with the KMS server. Follow the instructions from your KMS vendor as they differ from vendor to vendor. After the KMS has been configured, you will see that the connections status and the certificate have green checks, meaning we are ready to move forward. Now, we need to verify that all of the disks in the cluster are on version 5 for on-disk format prior to enabling vSAN encryption, since version 5 is a requirement. At this point we are ready to turn encryption on, since we have completed the first three steps. To enable vSAN encryption, click on the vSAN cluster, “Configure” tab, and “General” under the vSAN section, and click “edit”. Here we have the option to erase the disk before use. This will increase the time it will take to do the rolling format of the devices, but it will provide better protection. After you click ok, vSAN will remove one Disk Group at a time, format each device, and recreate the Disk Group once the format completed. It will then move on to the next Disk Group until all Disk Groups are recreated, and all devices formatted. During this period, data will be evacuated from the Disk Groups, so you will see components resyncing. Note: This process can take quite some time depending on the amount of data that needs to be migrated during the rolling reformat, so please plan accordingly. Once vSAN encryption is enabled, you are able to disable encryption; however, the same procedure is needed as far as reformatting all the drives in a rolling manner. You also have the capability of generating new keys for encryption. There are 2 modes for rekeying. One of them is a high level rekey where the data encryption key is wrapped by a new key encryption key. The other level is a complete re-encryption of all data. This second rekey (deep rekey) may take significant time to complete as all the data will have to be re-written, and may decrease performance. Enabling vSAN Encryption requires disk reformat with object resyncs. You don’t have to erase all the disks first prior to using native encryption unless you want to reduce the possibility of data leakage and have a decreased attack vector. However, this will result in additional time required to erase disks, reformat drives, and enable encryption. Enabling vSAN Deduplication and Compression still requires disk reformat with object resyncs whether the Disk Group is encrypted or not. Disabling any of the aforementioned features requires another reformat of the devices along with object resyncs. Today, one of the largest vSAN releases was announced. This release comes packed with new features, enhancements, and a lot of improvements; making vSAN 6.6 easier to deploy with enhanced performance, and a more complete HCI platform. What’s New with vSAN 6.6? Encryption is one of the main features for this release. This is a software solution rather than just using self encrypted devices (SEDs), which are not needed by the way. 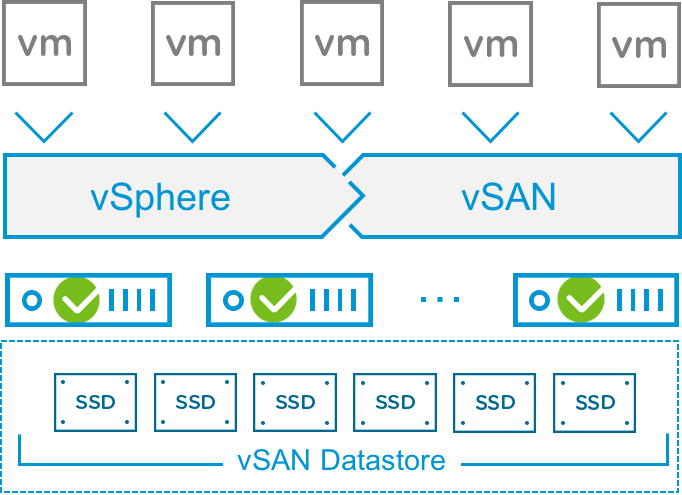 Any HCI can add SEDs and call their solution encryption ready, but vSAN goes a step further and provides software encryption for data at rest. The vSAN configuration assist allows customer to check hardware compatibility, conduct burn-in tests, check network and vSAN configurations, as well as getting recommendation for optimal cluster configuration based on current status. 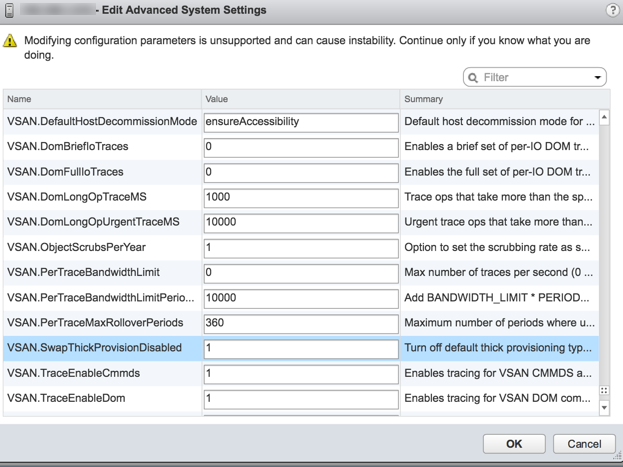 For example, the configuration assist will check to make sure all vSAN vmknics are configured properly, as well as recommending upgrading on-dik format to the latest versions. Such recommendations will allow for a configuration that follows vSAN best practices. This feature allows customers to be able to update outdated controller firmware and driver version for example. In such case the outdated hardware will be identified and you will have the option to download and install the latest version directly from the vSphere Web Client. This feature removes the need for vendor-specific tools as it provides an orchestrated hardware lifecycle management across the vSAN cluster. 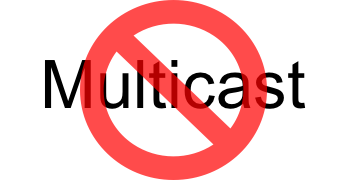 Although vSAN is not heavily dependent on vCenter, in the event that vCenter is not available we lose some visibility from the UI perspective. 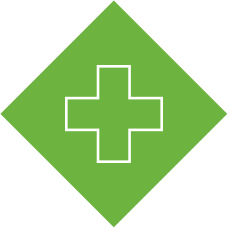 On vSAN 6.6, the HTML5 Host Client now has visibility and capability of doing health checks not only for the host itself but also for the entire cluster. 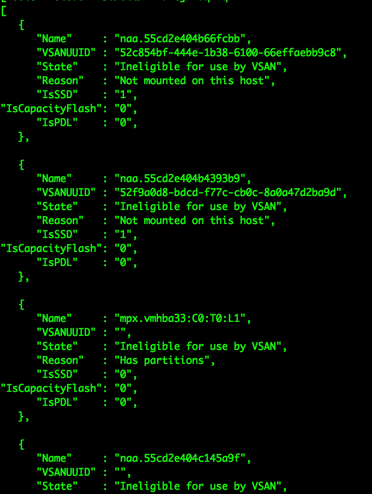 Alternatively you can use “esxcli vsan” commands for additional tasks. Such commands have been expanded to keep up with the new features. 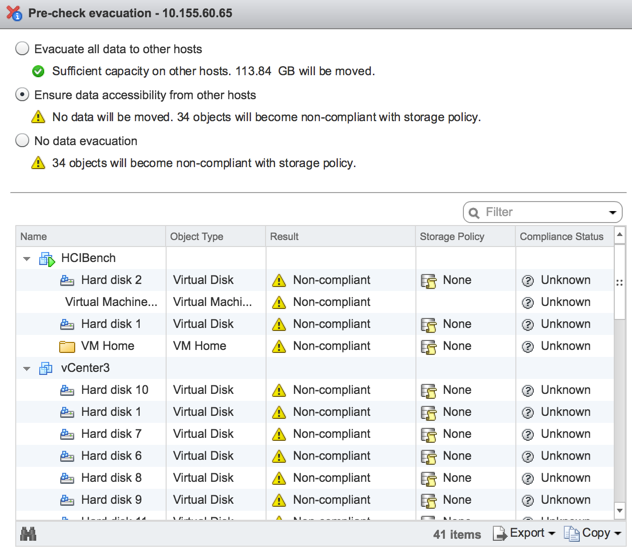 The vSAN health function has now significantly more checks to aid in proper configuration and troubleshooting. Monitoring and alerts have also been added for the new features such as physical disk health, networking, etc. On the performance diagnostics side, you are now able to query throughput, latency, and IOPs among others. Built into maintenance mode operation and disk/disk group removal, the pre-check allows for lower operational overhead, and reduces risk by helping ensure proper capacity remains after a host evacuation. The pre-check will show if there is sufficient capacity for data movement and how much data will be moved. I really like this feature as it gives visibility to the “What-if” for each option of maintenance mode. 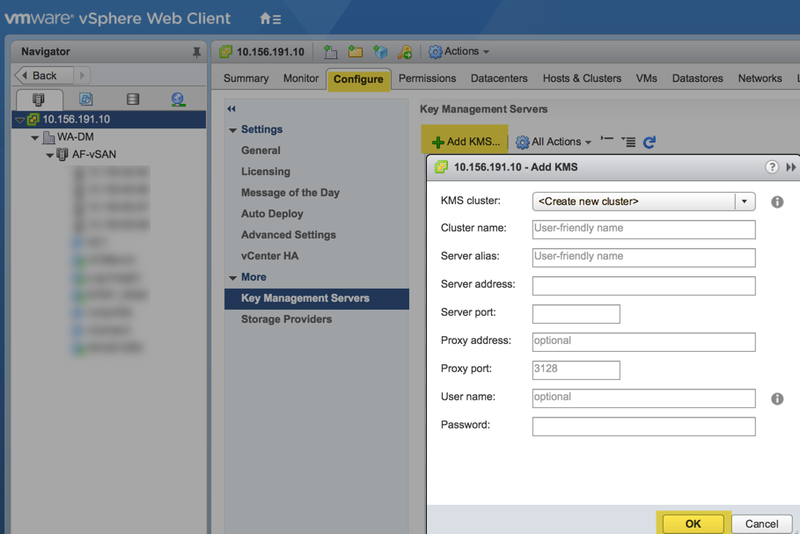 The new VCSA is now capable to deploy a vSAN cluster on a single node and place the VCSA appliance on the vSAN datastore. This eliminates the need for external storage, forgoing to claim disks, or bootstrap scripts. This makes greenfield deployments quick and easy for vSAN clusters. Yes! Another big step here. The need for multicast is no longer required. In fact, once you upgrade your vCenter and hosts to version 6.6 the networking mode is automatically changed to unicast. vSAN 6.6 intelligently predicts device failure and proactively move data out of the failing device before it actually fails and cause a Permanent Device Loss action. I’ll be writing a few more blogs about the new features. Stay tuned.